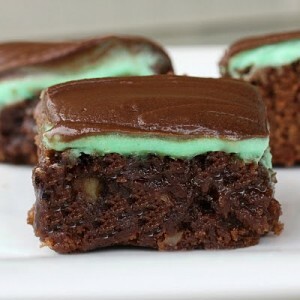 These mint brownies are a great idea for St. Patrick's day. Preheat oven to 350 degrees. Melt butter and mix in cocoa. Allow to cool. Add honey, eggs, sugar, flour, baking powder, and salt. Mix well. Add nuts. Pour batter into a greased 9-by-13 baking pan. Bake at 350 degrees for 25 minutes. Cool. Prepare mint icing: Soften butter. Add salt, corn syrup, and powdered sugar. Beat until smooth and fluffy. Add mint extract and food coloring. Mix. Add milk gradually until the consistency is a little thinner than cake frosting. Spread mint icing over brownies. Place brownies in the freezer for a short time to stiffen the icing (very important step I realized since I was impatient). Remove from the freezer and carefully add a layer of chocolate icing. We liked ours stored cold in the refrigerator or you can store them at room temperature. This post was originally published on November 29, 2016.